Stylish Christmas is another of the Distinktive stamp sets and has GREAT images! The Distinktive stamp set - Stylish Christmas - makes Christmas cardmaking easy! Given that Distinktive stamps work best with ink pads that aren't too juicy, I used my old Real Red ink pad. It wasn't really quite inky enough but, wanting to avoid over-inking the pad with my ink refill, I used my Stamparatus instead. I inked and stamped the red poinsettia about three times before I was happy with the colour intensity. I did use one of my new ink pads (Call Me Clover) for the leaves but I was careful to tap very lightly into the ink. 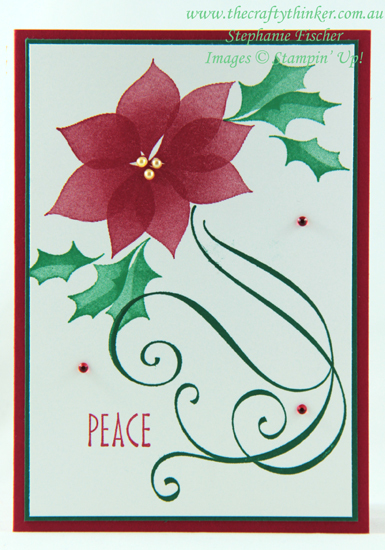 The flourish is stamped with Shaded Spruce ink and I used the Real Red again for the work Peace. The base card is Real Red and there's a layer of Shaded Spruce under the decorative card front. What's Christmas without a bit of bling? So I added some Share What You Love Artisan Pearls to the centre of the Poinsettia and scattered some Red Rhinestones.